Saying goodbye to 2016 was mainly sweet and only a little bit bitter. It was so sweet because its the year I took the great leap of faith into starting my photography business. I was able to photograph 50 families! I discovered what I liked and didn't like about my business. How to become more authentic and not try to be like someone else. I discovered the kind of photographs I am drawn to create and the emotions I desire to capture. The journey has been hard and it's no where near being over but so worth every tumble and celebration! I cannot wait to see what 2017 brings but until I can come up with my favorite family photos from this year I HAVE to show you my favorites from this past year. Enjoy!! 1o. Being able to document the reunion of families is such a huge part of my why. I love being there for the first touch in months or even a year. 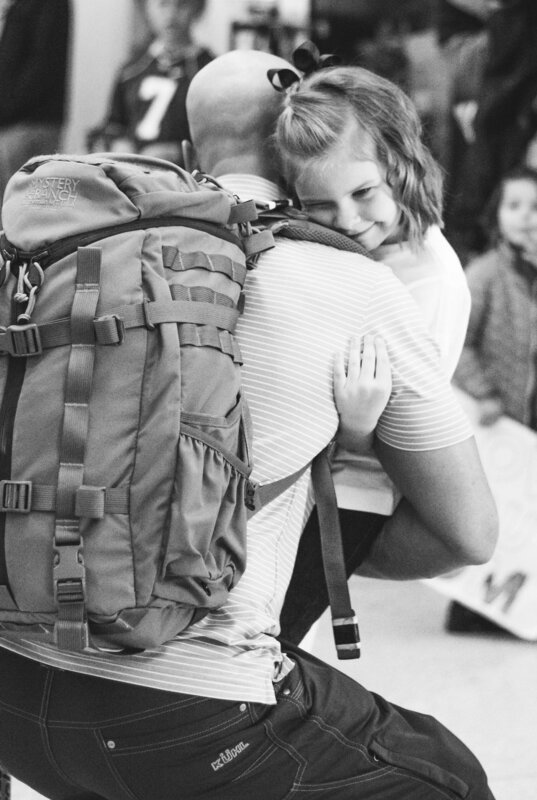 There are more of my favorite military homecoming photos here! 9. Spokane is beautiful in the fall. But what is more beautiful is that this girls family was one of my first returning clients! And that is always exciting. Six months before, when I had my first mommy & me mini-session, she wasn't even walking! And now this beautiful little girl was running around with the more smiley face on! Watching these little human clients grow right in front of my eyes just makes me so happy. 8. Meet Isaac. He is my best friend's babe and this was his one year cake smash celebration. Isn't he just the cutest? He definitely wasn't into the cake at all, hence the tear running down his face. 7. I love a good ole dad pic! Rob sure knows how to make photo sessions fun when its 10 degrees outside! View more of this session here where there are marshmallows and mistletoe included! 6. If you following me on instagram (oh you don't? well click here and then follow! Let's be friends), then you probably say this photo recently. But its from way back in the spring time. I see so many things I would change about the editing I did but I love the adoring new mom look on Lindsey's face and Lincoln checking me out! 5. I look back on this photo and just smile sooooooo big! This family session was a blast and I giggle every time I look through these photos. It came at the most perfect moment for me. The session took place only four days after Brenton deployed and the Dad in this photo was about to deploy after days later. The kiddos were hams in front of the camera. You can just tell that they adore their parents and have such large personalities in their little bodies! Having photos of fathers and kiddos together are part of your legacy. 4. I was a second photographer at a wedding this fall and captured this sweet moment. The flower girl was twirling in front of this huge red wall! She was perfectly shaded from the sun and no one was around her. She was in that state of beauty. Thinking no one was watching her and just enjoying the moment. We can learn a lot from this moment embraced by a little girl. Dance like no one is watching... What harm can it do? None! So get out there and boogie in the beauty! 2. The back story of this photo... Graeme is holding baby Connor like the great big brother he is. Liam comes and sits next to them when he decided to touch baby Connor's head a little too hard. Graeme promptly replies back sternly, "Do not hit MY baby brother." We could not stop giggling at his assertiveness. Those three boys are going to have so many great memories growing up together! 1. My friend Jessica and her son Isaac came to my mommy & me session in May when Isaac was 6 months old. Jessica says that she never truly enjoyed being around children until she had Isaac. No she can't imagine her life without him. Can't you tell by the look on her face?